Omega-3s get a lot of notoriety – and for good reason! Not only are they essential for good health, but we don’t get enough of them in our diets. Omega-3s are a kind of fat. Fats are not just a storable source of 9 calories per gram. Different fats are used by our bodies for different essential functions. They’re part of the membranes that surround each cell and are especially important in the brain and nerves. They can mediate the effect of our immune cells as well as influence the production of neurotransmitters and hormones. Omega-3s are anti-inflammatory and have health benefits for the heart, brain, and our mental health. There are several types of fats (a.k.a. fatty acids). They’re broken down into two main categories: saturated and unsaturated. Unsaturated fatty acids are further broken down into monounsaturated (MUFAs) and polyunsaturated (PUFAs). The main types of PUFAs are omega-3s and omega-6s. We don’t hear much about omega-6s because we tend to get too much of these in our diet already. Omega-6s are found in meat, poultry, and many common seed oils like corn and sunflower. So, the focus has been to educate people to swap out some of those omega-6s to get more omega-3s like our ancestors did. ALA is essential – literally essential for health, just like essential vitamins and minerals. This is because the body can’t create it from other nutrients. It is this omega-3 that the body needs in order to create the biologically active EPA and DHA. In fact, research shows that the primary role of ALA is to be the building block for EPA and DHA. What I mean by “biologically active” is that EPA and DHA are the forms of omega-3s that provide the health benefits. They’re the ones that are active in the body. ALA is the plant-based omega-3 and is found in many seeds like flax, hemp, and chia. It’s also found in walnuts, and oils from olives, canola, and soy. EPA and DHA, on the other hand, are found in seafood, especially oily fish. They are also found in algae, which is a vegetarian source. FUN FACT: Fish have the biologically active forms of omega-3s because they eat the algae and store extra EPA and DHA in their fat. The conversion of plant-based essential ALA into the biologically active EPA and DHA is complex and requires several steps and enzymes. Unfortunately, the process isn’t very efficient. The conversion rate of ALA to EPA is about 8-12%, while the conversion to DHA is only about 1%. Some studies show that women may have slightly higher conversion rates compared to men. Despite all of this biochemistry, the real question is how do they work in the body and what are these health benefits? There are many inflammatory diseases like allergies, asthma, arthritis, and autoimmune diseases. There are also many other diseases that may not be inflammatory per se but have a substantial inflammatory component. These include diabetes, obesity, cancer, heart disease, depression, and neurodegenerative diseases such as Alzheimer’s. Many of these conditions are becoming more common. Reasons include allergens, infections, environmental and dietary toxins, and even stress. As mentioned earlier, one of these reasons is our inflammatory diets. Yes! What you eat can increase or decrease the amount of inflammation in your body. An inflammatory diet contains a much higher intake of omega-6s compared with omega-3s. In fact, the higher the intake of certain omega-6s, the higher the production of certain inflammatory molecules. Many animal and some clinical studies have found reduced inflammation when omega-3 supplements were taken. A review of 30 studies showed that fish oil supplements reduced the pain of arthritis, particularly rheumatoid arthritis. How do omega-3s reduce inflammation? Two ways. First, they are used to create anti-inflammatory molecules themselves. Second, they can inhibit some of the mechanisms that cause inflammation in the first place. Omega-3s are used to produce certain anti-inflammatory molecules (e.g. prostaglandins, resolvins, etc.) that combat inflammation. They also reduce the production of enzymes that create inflammatory molecules, and can even reduce the expression of certain inflammatory genes. Omega-3s become incorporated into the membranes of immune cells and affect their inflammatory response. Some animal studies even show that omega-3s can reduce inflammation by helping to reduce obesity! If you take away the water weight, your brain is about 60% fat. DHA is the main fatty acid in the brain’s grey matter, while EPA makes up about 1% of the total brain fatty acids. DHA is the most important PUFA in the central nervous system. It’s the most abundant component of the membranes of nerve cells and plays important roles in both structure and function. DHA helps nerve cells insulate their electrical signals, stabilize their membranes, and reduce inflammation. It’s important to ensure enough omega-3s for optimal brain health, as well as baby’s brain development during pregnancy and beyond. The last trimester of pregnancy sees the greatest need for DHA for the baby. This is when the brain and eyes are maturing. More DHA is transported to the infant during this last trimester compared to the first two. Children born preterm are more vulnerable to deficiency, and studies show they have lower levels of omega-3s in their blood compared to infants born at full term. Preterm infants that were given a formula containing omega-3s show a small improvement in neurodevelopmental outcomes compared to preterm infants given formula without omega-3s. This does not seem to affect full-term infants. DHA is found in breast milk. If mothers reduce the amount of omega-3s they eat, there is a reduction in the amount of omega-3s in their breast milk. Recent studies found positive effects on cognition (ability to think) and brain connectivity in young children who had higher DHA intake during infancy. On the other side of the spectrum, in terms of neurodegeneration, age is the greatest risk factor for Alzheimer’s disease (AD). There’s been a lot of research on the effects of omega-3s and AD. People with higher omega-3 intakes have a lower risk of AD; people with AD tend to have lower levels of DHA in their blood. Because of DHA’s effect on certain brain cells (glial cells), it was thought that supplementing with DHA may help with AD. This was tried in animal models and was shown to boost an enzyme that helps to clear the detrimental Aβ plaques that are common in AD. Also, animals given an omega-6 enriched diet had higher levels of plasma Aβ as well as more mood issues. A recent review of several high-quality clinical studies looked at the use of omega-3 supplements to try to help with mild to moderate AD. After combining the results of those trials, researchers found that after six months, there was no consistent benefit in quality of life, cognition (ability to think), or mental health. One study showed a small improvement in activities of daily living amongst those who had the omega-3 supplements. A more recent larger study showed that omega-3 supplements may have a small benefit if taken early in the development of AD, but other studies don’t show the same benefit. More research is needed to understand the role omega-3s have for people with AD. FUN FACT: One symptom of deficiency of the essential omega-3 (ALA) is visual dysfunction. This is because of how important DHA is, not only for the brain but also for the retina of the eye. People who regularly eat and/or have higher blood levels of omega-3s are less likely to feel depressed or anxious. One randomized double-blind study looked at depressed undergraduate students. They found a significant reduction in symptoms in those who took omega-3 supplements, compared to those who took a placebo. Studies have also shown a mild to moderate benefit in symptoms for those taking omega-3s versus placebos. Some of those studies also showed a comparable result to certain antidepressant medications. These studies also concluded that the evidence was not very strong yet, and more research with higher-quality studies is needed. In terms of aggression, a recently published double-blind randomized study tested whether omega-3 supplements could help reduce aggression. They gave one group a supplement with EPA and DHA, and another got a placebo. The participants taking the omega-3s found that after 6-weeks they felt that their aggressiveness significantly decreased. The links between mental health and inflammation are many. For one, certain medications that cause inflammation can induce mental health symptoms. At the same time, some antidepressant medications are anti-inflammatory. In fact, taking omega-3s along with antidepressant medications has an improved effect over antidepressant medications alone. The role of omega-3s in mental health is not just due to their anti-inflammatory abilities. There is also evidence that omega-3 deficiency can lead to impaired function of the neurotransmitters serotonin and dopamine, and these can result in some mental health issues. There is also the connection with stress hormones. People who feel depressed tend to have higher levels of the stress hormone cortisol in their blood. The omega-3 EPA may reduce the production and release of stress hormones. Omega-3s started getting famous for heart health because of research dating back to the 1970s. At that time, researchers found that Greenland Inuit, despite eating a lot of fat, had a lower rate of heart disease and fewer risk factors too. So, they thought that it wasn’t the amount of fat eaten that was unhealthy for the heart, but rather the type of fat eaten. Many early studies of fish consumption and omega-3 supplementation found a lot of evidence of a heart-healthy effect. They found that people who ate fatty fish several times each week had lower risks of heart disease than people who didn’t eat any fish. In terms of supplements, a large study found that people with heart disease who took ALA or fish oil capsules every day had reduced risk for death, heart attack, and stroke compared with those taking a placebo. Other studies show that higher levels of EPA and DHA in your blood are associated with lower risk factors for heart issues. Many more studies showed that fish oil helped to improve blood lipids and cholesterol, reduced blood pressure, improved heart rate and rhythm, “thinned” the blood, had beneficial effects on blood vessels and stabilized atherosclerotic plaques. Lately, there seems to be a growing body of evidence that the improved heart health effects of omega-3s may be smaller than we originally thought. Some researchers think these conflicting results may be due to the fact that fewer people smoke now, and also that the standard of care for people with heart disease has been improving over the decades. The bottom line when it comes to omega-3s and heart health is there is evidence that omega-3 supplements lower some risk factors for heart disease – the evidence is just not as overwhelmingly strong as we first thought. Plus, since these supplements tend to be quite safe, many expert medical associations still recommend them for heart health. NOTE: Talk to your healthcare professional before starting any supplement regimen, especially if you have a medical condition or are taking medications. In order to get the health benefits, you have to regularly eat enough foods that are high in omega-3s. It’s thought that our ancestral diets included approximately equal amounts of omega-3s and omega-6s. Now, our intake of omega-6s is up to 20x higher than our intake of omega-3s. This is why there is such an emphasis on getting enough omega-3s. When it comes to plant-based sources of omega-3s, flax is the winner! Up to half of flax’s total fatty acids are the essential omega-3 ALA. Canola, walnuts, and soy, are less concentrated sources of ALA, with about 10% of their fatty acids as ALA.
To eat the recommended amount of omega-3s have at least two servings of fatty fish each week. Fatty fish include salmon, mackerel, herring, and sardines. This is a recommendation from the World Health Organization, as well as other health authorities. In the US, there have been consistent recommendations to increase fish intake for almost 20 years. Despite this, the average American still only eats about 1.3 servings of fish per week. Eating fish and seafood gives you a lot more nutrition than simply taking a supplement. They contain protein, vitamins D, and B12, as well as the minerals iodine, selenium, potassium, and magnesium, to name a few. When it comes to choosing fish, bigger is not better! Large fish that feed on smaller fish have higher concentrations of toxins in their fat. To reduce your intake of things like methylmercury and organic pollutants, limit your intake of tilefish, king mackerel, shark, and swordfish. And anyone who is pregnant, breastfeeding, or a child, should avoid these types of fish altogether. There are also non-fish sources of omega-3s! Some foods are fortified with omega-3 oils. Some baked goods, pasta, dairy, eggs, dressings, and spreads may contain added flax, algal, or fish oils. Omega-3 eggs are produced by hens who’ve had flax seeds, chia seeds, and/or fish oil added to their feed. In fact, hens fed the plant-based ALA produce eggs with ALA, and those fed fish oil produced eggs with EPA & DHA. NOTE: Omega-3 supplements are by no means a “treatment,” but can help in cases of insufficiency. In terms of safety, fish oil supplements have a long history of safety. However, be cautious if you’re planning or recently had surgery, or have a compromised immune system. Speak with your physician or pharmacist if you take pain, anti-inflammatory, or blood-clotting, or blood lipid/cholesterol medications. Speak with your healthcare professional before changing your supplement regimen. For those who don’t eat fish, supplements can be an option. Omega-3 supplements are one of the most popular supplements taken. It’s recommended that most adults get at least 0.5-1.6 g per day of combined EPA and DHA, preferably from food. In terms of ALA, 1.5-3 g per day is beneficial, and that can be from plant-based foods or supplements. Fish liver oil is from the livers of the fish, and also contains fat-soluble vitamins like vitamins A and D.
PRO TIP: Refrigerating your fish oil supplements can help prevent the delicate fats from going rancid. Flax is the best plant-based source of the essential omega-3, ALA. The two biologically active omega-3s, EPA, and DHA, are from fish or algae. It’s always recommended to get your nutrients from food as much as possible. At least two servings of fatty fish each week is recommended. If you consider supplementing, make sure to follow directions on the label and keep them refrigerated. If you have any medical conditions or are taking medications, make sure to speak with your healthcare professional. Gintya, A.T. & Conklinb, S.M. (2015). Short-term supplementation of acute long-chain omega-3 polyunsaturated fatty acids may alter depression status and decrease symptomology among young adults with depression: A preliminary randomized and placebo-controlled trial. Psychiatry Research. 229(1–2); 485–489. Watanabe, Y. & Tatsuno, I. (2017). Omega-3 polyunsaturated fatty acids for cardiovascular diseases: present, past, and future. Expert Rev Clin Pharmacol, 10(8):865-873. doi: 10.1080/17512433.2017.1333902. I hope this post was helpful for you, and if you have anything to add, or there is anything I’ve missed out, please do share in the comments below. 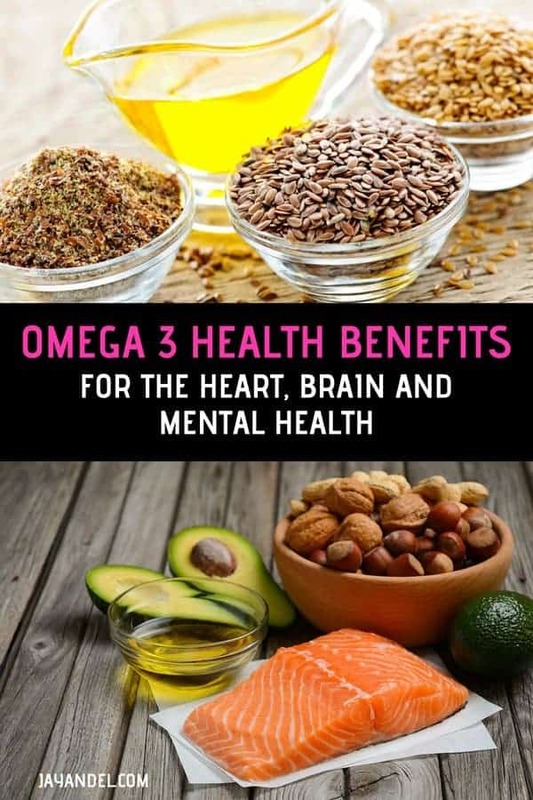 A tiny request: If you Enjoyed Omega-3 Health Benefits; For The Heart, Brain and Mental Health, please share.